Audrey is back with us after last week – and Mara didn’t go away. Everyone agrees they have no idea what happened and why Duke’s released Trouble caused an Audrey to manifest, but it did. Duke and Audrey are all for handing Mara over to the Guard, but Nathan isn’t so keen with Dwight having left town (probably because of his estranged and now dead sister). Audrey was connected to William last season, any harm done to him happened to Audrey as well, he worries the same may be true for Mara (go downstairs and stick her with a pin or something and test it). Audrey doesn’t want to spend any time with Mara so it’s Duke who goes down to figure out whether there’s a connection or not. Of course, Mara isn’t co-operative but agrees to tell them – in exchange for the Crocker journal. Duke realises she’s worried about the Troubles his family has absorbed because, unlike all the other Troubles, Mara isn’t immune to the ones inside Duke. Duke decides a different plan – cut off one of Mara’s toes then Audrey would lose hers, proving it (uh, I think my pin prick may be a more sensible suggestion). Of course, Duke’s ridiculously extreme suggestion means Mara knows he won’t do it – because he’s not going to cut off Audrey’s toe. 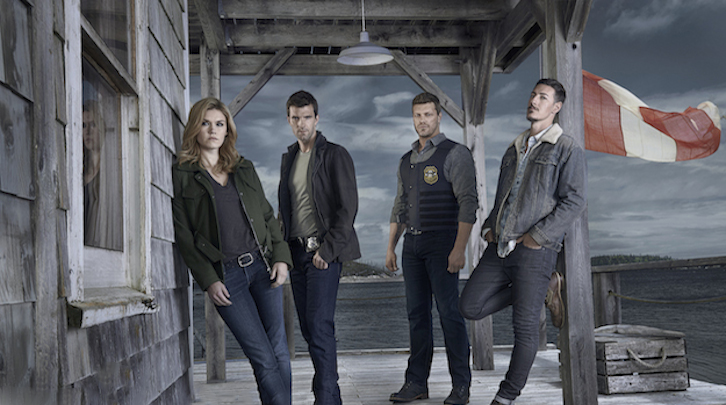 Of course, when they go to the Trouble scene (with three dead) not everyone is accepting Nathan’s handwave and the grieving survivor assumes Audrey is a monster who caused the deaths; though Rebecca (a new recurring police officer) assures her Audrey only looks like Mara. Though Rebecca herself doesn’t agree – she’s just following Nathan’s instructions. The dead themselves haven’t left bodies – just shadows on the wall. They do connect the victims to the farmer’s market and Nathan realises that “hey she’s totally not a bad guy any more” isn’t really going to keep Audrey safe, so asks her not to go with him. This turns him into a ghost – still around but unable to touch anything or be heard. He walks through solid objects. Including Rebecca who finds his shadow. Duke and Audrey arrive at the scene and we learn Audrey has none of Mara’s memories. Audrey is determined to reverse the Trouble, no-one accepts Nathan is dead while Duke tries to wrangle irate Guard members. The Guard agree to watch Audrey until she slips and reveals herself to be Mara. Nathan runs into a guy who can see and feel him – he says they’re ghosts. As in dead – and he died from a car crash so it’s not even from the Atomic Flash Trouble (which is what they’re calling the bright light and shadow thing). He says there are others and some of them have become rather disturbed by their experience. Ghost guy sends Nathan to the cemetery where Nathan hopes to learn a way to communicate with Audrey. There he meets Morgan who acts as a ghostly induction guy. He’s been a ghost for two years and says they can’t talk to the living; Nathan finds it dubious that there’s so few (and doesn’t accept the idea that the rest have “moved one”). He shows Nathan his grave (Morgan had cancer) and how he died swimming – Nathan points out that he’s not actually dressed for swimming and Morgan has a pat excuse for why he’s actually dressed (ghosts appear as they looked in a happy moment with someone you love). This isn’t the first time Nathan spoke to a ghost – he spoke to his dad in the cemetery thanks to a Trouble that let the dead talk to the living – a Trouble Duke absorbed by killing the person. So Nathan realises Duke releasing that Trouble will let him talk to Audrey. Audrey, meanwhile, is using herself as bait to draw in Reggie and his angry fellow Guard. So being in Mara’s head hasn’t increased Audrey’s intelligence much. Turns out Reggie doesn’t have the Trouble (are we shocked?) and after some threats he becomes a bright light and shadow himself. The Guard, of course, assume Audrey did it and she gets knocked out and kidnapped. Witnessed by Nathan. She apparently helps because next we see Duke, with a gun, going to rescue Audrey before a man with a disintegrate Trouble touches her. Duke offers to shoot or arrest them but Audrey wants to let them all go so she can prove to them all she’s Audrey. Duke goes back to Mara and she cuts herself on her cuffs to prove that she and Audrey aren’t connected. She’s sure they won’t kill her or get rid of her because her immunity means she’s the only one who can speak to Nathan – they need her. Nathan returns to the cemetery to find a ghost’s murdered body – and the words “even ghosts can die” smeared on his grave stone in blood. It’s a fascinating conflict. Far more so than Nathan playing ghost for more pathos. As a story it’s interesting, but I’m not really invested in Nathan and Audrey playing star crossed lovers – especially since that means Duke and Audrey are now going to become closer and it feels like we’re dragging up and rebooting a love triangle we don’t need and have already buried.